Assessors are great fish for a reef tank, but they can be on the expensive side. 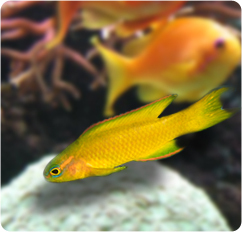 They usually don’t bother any fish, coral, or invertebrates, and are very peaceful fish. They can be kept in tanks as small as 30 gallons and they need some caves and rock overhangs, as they usually either swim or hang upside down against the rock overhangs. They should be kept with peaceful tank mates and they usually don’t do well with the more aggressive dottyback/basslet group. You can keep groups in a tank, and they have spawned in the aquarium, but to maintain a group you need a larger tank, at least 75 gallons.